TWO of the most experienced and influential men of sea and space spent yesterday afternoon talking with 400 Kapolei Middle School students. Retired Navy Capt. William Shepherd, a former NASA astronaut and the first commander of the International Space Station, and Nainoa Thompson, navigator of the Hokule'a, spoke at a 45-minute assembly and stayed after to answer even the oddest of questions about space and the sea. 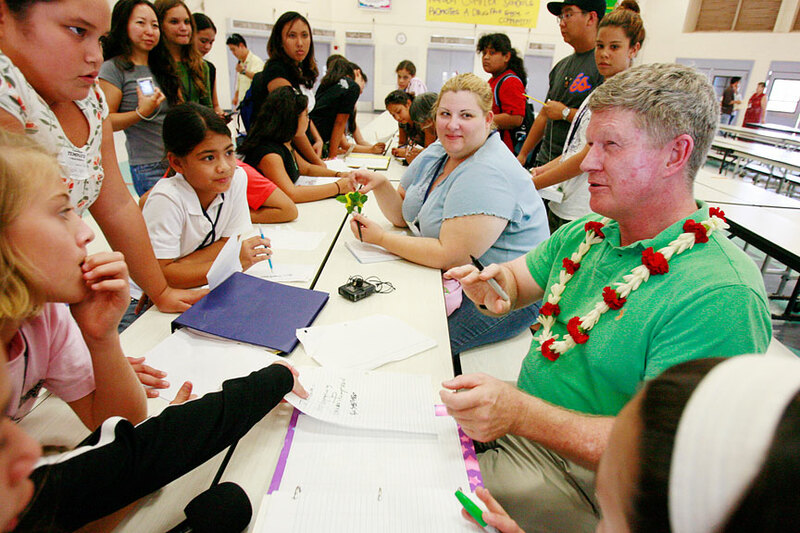 Shepherd and Thompson are close friends who met in 1990 during a three-way amateur radio call between the Hokule'a, which was voyaging from Rarotonga back to Hawaii, the shuttle Discovery, which was passing over Hawaii, and 30,000 school kids. Kapolei Middle School received a call on Monday saying Shepherd was going to be in town and wanted to talk to its students. He came to Oahu to celebrate the official opening of the Office of Aerospace Development and the inauguration of the Pacific International Space Center for Exploration Systems. "I like talking to the kids to find out what they know and don't know about space," Shepherd said. "Some of them are quite knowledgeable and know more than their teacher." Shepherd, 56, a former Navy SEAL, was a NASA astronaut for 17 years and flew three flights as a mission specialist on the shuttles Atlantis (1988), Discovery (1990) and Columbia (1992). From 1993 to 1996 he was a program manager and deputy program manager for the International Space Station, and in 1996 was selected as commander of the first crew to live aboard the space station. "It's a great honor to have him here to talk to our kids and inspire our kids," said Marvin Yonamine, the school's student activities coordinator. In 2000, after years of training in Moscow, Shepherd and two other Russian cosmonauts docked at the space station and started initial operations in Earth orbit. During their 141-day mission, Expedition One was visited by three space shuttles, added two modules to the station and completed a space voyage of 58 million miles. Students watched a 20-minute video of the astronauts' preparation in Moscow, expedition to space and homecoming. They particularly enjoyed watching the men eat, exercise and sleep in space. 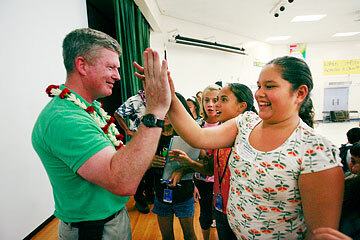 "It was cool how they were floating and eating," said sixth-grader Karlee Kawaa. About 30 to 40 students stayed after the assembly to shake hands and get autographs. "I like seeing the clips of space ... when they were fixing the space station," said seventh-grader Stefanie Michaud. Shepherd said one of the cosmonauts was a former Russian fighter pilot whose job was to train to shoot down American planes. And Shepherd, being in the Navy, had the Russians as adversaries. "When we were looking down at Earth ... in this moment we were flying in the International Space Station, we weren't Americans or Russians anymore," he said. "We were living and working together on a totally different enterprise." Shepherd has a Bachelor of Science degree in aerospace engineering from the Naval Academy and a master's degree in mechanical engineering from the Massachusetts Institute of Technology. Today he lives in San Diego and is the president of Trex Federal Systems. "In our generational time, (Shepherd) is one of our greatest explorers," Thompson said. "Every time he comes to Hawaii, he calls me up. And every time he calls me, it's an honor."